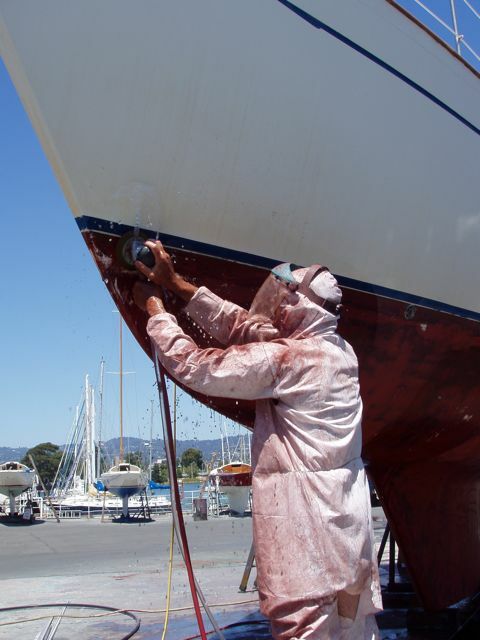 We've always paid a company to paint our hull, sensing that there was some magic involved. Untrue! Effort, yes, but no magic. 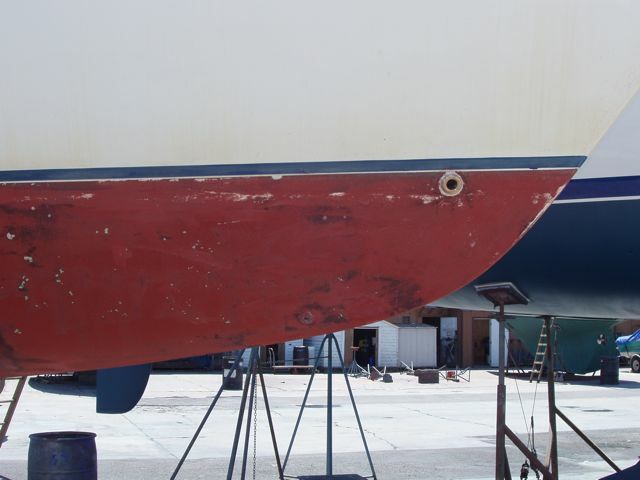 We rented a compressed-air-powered orbital sander (water and electricity are a bad mix) and I sanded the entire hull to prepare the old paint surface to adhere to the new paint. It was dirty and tiring, and it's for that one pays. Each "station" at Svendsen's has power, water, and compressed air available. We had two transducers that no longer functioned: an old knot log (speedometer) and a depth sounder. The left hand hole was for the old knot log and we no longer use it so we had it filled. The right hand hole held the old depth sounder, and that was filled and re-drilled for a new Raymarine "Triducer" for depth, water temperature, and speed. Why temperature? Many of the world's currents can be detected by differences in water temperatures, the Gulf Stream being a case in point. We had to paint around the work-in-progress. The sanded hull, ready for painting. 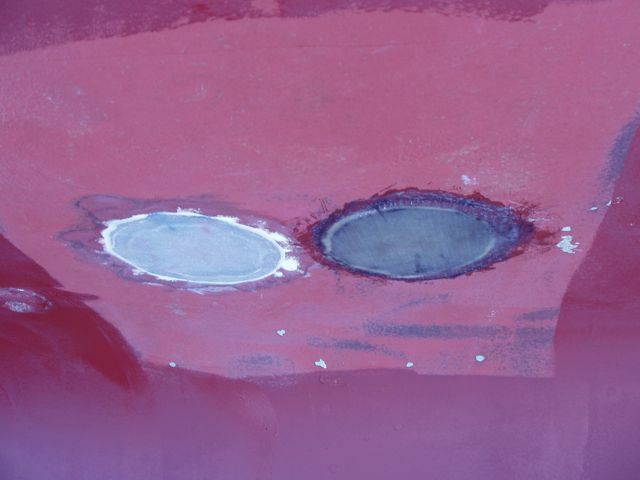 The black areas are where the "signal" coat of black paint is exposed through the overlay of red paint See black, time to repaint. The through hull near the bow is our NEW installation! More sanding photos of the hull. The white areas are exposed hull. 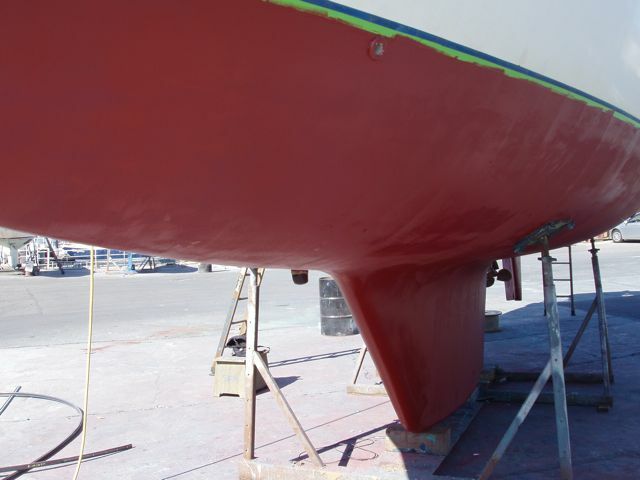 Most are where previous painters have had to skip areas where the boat braces were placed, hence their square shape. Tyvek suit, diver's goggles, and face mask were important to keep me free of paint. You can see the brown air hose and the clear Tygon tubing used to keep water washing over the sander. Even with the gear, it was very physically demanding and very dirty work. 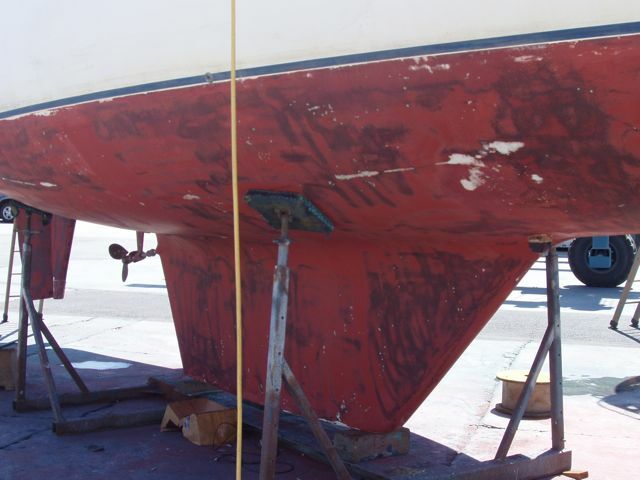 You can see dripping red-paint-infused water dripping from the hull. New paint! She looks much better. A gallon of paint provides one coat. Note the green tape along the boot stripe (blue stripe). It's $25/ roll tape that's used to mask for painting. 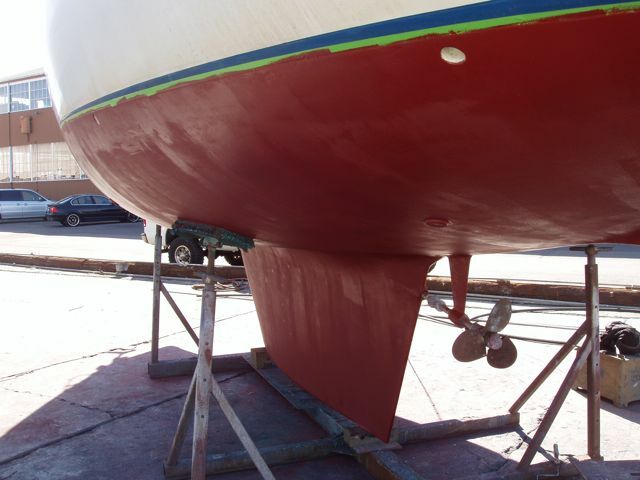 Port side with new paint. This is the first coat and she'll get two. Including the remaining layers, she'll be protected for a few years.